David Menzel, Andrew Huculiak and Cayne McKenzie have been playing music together since they were teenagers. 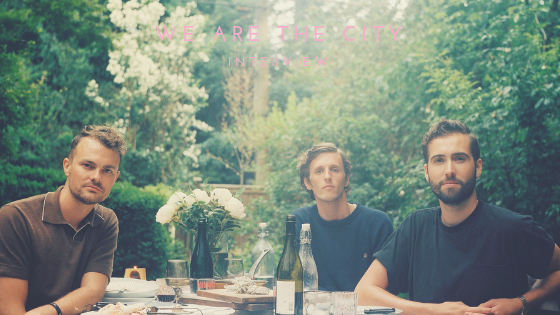 Their band, We Are The City, has come a long way in 10 years, and their latest release shows that. AT NIGHT is actually the first of two albums being released by the Vancouver indie-rock act. They spent two years working on an album called RIP and after completing it they felt that there was still more to be said. It started with them going back to scraps of songs from sessions working on RIP and ended with 11 more songs - ultimately ending with AT NIGHT. For them, this was also about empowering others. They recognized that the music industry is in a place where not only is there virtually zero money in recorded music but that recorded music can be done anywhere by anybody. Because of that, they wanted to show that with the right resources and dedication, anybody can figure out how to share their music with the world. The guys have used their creativity to push themselves from one boundary to the next: They unveiled masked alter-egos (2011’s High School EP), created an album with an accompanying, award-winning Norwegian-language feature film (2013’s Violent), and staged a live stream of their recording sessions (2015’s Above Club). Now that AT NIGHT has been released, it will be interesting to see how the tracks of RIP began this spontaneous production. We Are The City compares their journey together to a marriage - it won’t work if the individual doesn’t work. After a decade of sharing this band with one another, they still don’t know how the stars aligned for them but they do know that being able to connect on a level creatively and personally is hard to come by.